Was Medieval Dublin the conscience core of the Viking world? This was the question posed to us by Dr. Stephen Harrison on Thursday evening. Following the highly anticipated publication of his project “The Viking Graves Project”, after some fifteen years in the working, Dr. Harrison held the attention of a teeming crowd as he passionately spoke about his project. While informing us of the details of the project, Dr. Harrison also accentuated the variety of hidden issues and problems with the collection and scrutinizing of the materials available for use. Although problems with the antiquarian tradition of recording and preservation data was not unique to Ireland, the Royal Irish Academy’s methods of the documentation of Viking Graves left a lot to be desired. Records of the Viking Grave objects were not only limited but were frequently contradictory, with references being mixed up or not registered at all. For example, a sword unearthed in College Green was given four separate registration numbers. In order to overcome these issues, acquisition groups, based on location and dates, were established and in time were further filtered down to distinguish artefacts from each other within these assemblages. By doing this, it was then applicable to work out the minimum amount of Viking Graves in Ireland, an objective that had never been achievable prior to the project. The outcome of these acquisition groups was astonishing. From 63 acquisition groups, collectively composed of 401 artefacts, it was arbitrated that there are 107 Viking burials in Ireland. Furthermore, it was also determined that of these 107 burials, three quarters of all furnished Viking graves and four fifths of all Irish Viking grave goods are from Dublin and even more curiously over half of all Irish furnished Viking graves are linked to Kilmainham – Islandbridge. In addition to this, the project enabled the ability to effectively map out the burial complexes in order to further analyse any distinctive patterns. This led to the questioning as to whether or not Dublin was in fact the centre of the Viking Western world. 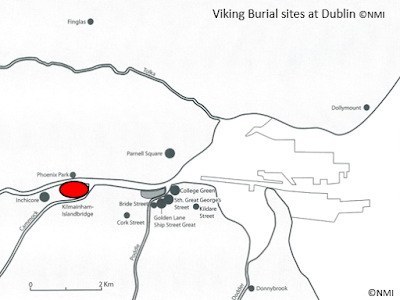 Fig 1: Viking Burial Sites at Dublin. © National Museum of Ireland. 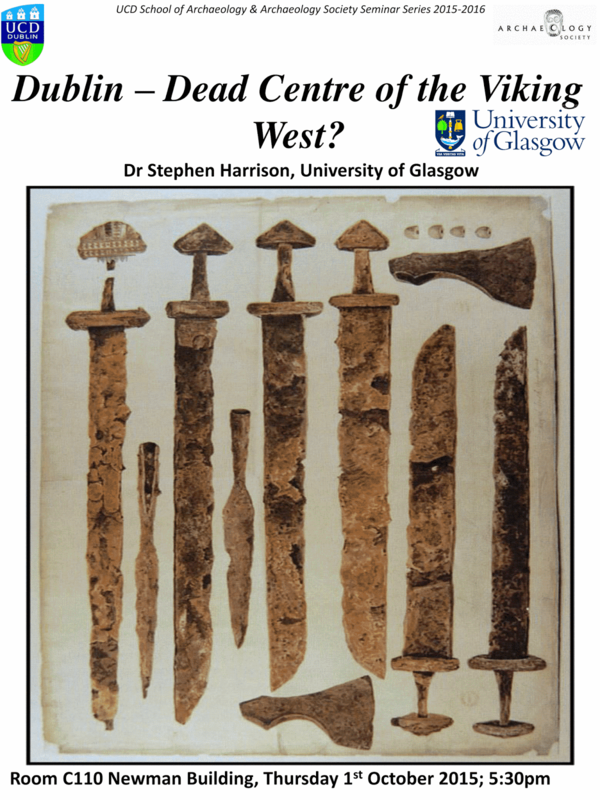 In order to answer this question, Dr. Harrison examined the diversity and distributional patterns of Viking burials between Ireland and the insular British Isles. He uncovered that 21% of all Insular Viking graves and 29% of all Viking grave goods found throughout Ireland and Britain, are found in Dublin. This arises the question as to whether or not this is simply caused by a statistical blip and other Viking complexes around Ireland have yet to be located. Dr. Harrison made the compelling argument that due to the scale and extent of these Irish Viking burial complexes that this interpretation simply isn’t plausible and that location of Viking burials is deliberately concentrated in Dublin. In conjunction with this, Dr. Harrison, drawing upon the work of Neil Price, also acknowledged the unconventionally and uniqueness of Irish Viking graves and the rituals that appear to accompany these graves. Not only did Kilmainham-Islandbridge produce the largest number of balances in either Britain or Ireland, but was one of the prime locations where weapons were consciously destroyed beyond any repair. Predominately in the central zone (Kilmainham-Islandbridge) were weapons deliberately bent, damaged or cremated as part of a carefully controlled ritual. This is perceived to be interconnected with the ideology that weapons, and in particular swords, are symbols of male dominance and power with Viking burials often being furnished with more weapons than one individuals could comfortably carry. 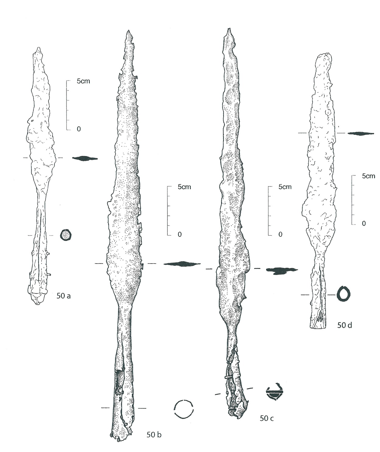 In addition to this, the distinction of Irish Viking weapons from that of the rest of the Viking world further exhibits the uniqueness of Irish Viking Burials. Not only were Irish Viking swords more elaborately decorated than their continental counterparts but other weapons, such as Dublin type Spearheads are found nowhere else in the Viking world. 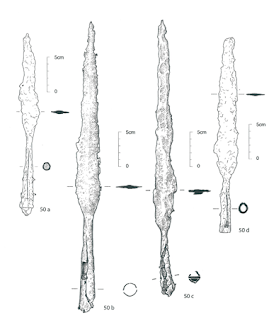 Smaller in size than traditional Scandinavian spearheads, the Dublin Type with its decorated rimmed sockets, was used primarily for throwing rather than for stabbing. Similarly Dublin type shield bosses were equally exclusive to Ireland. 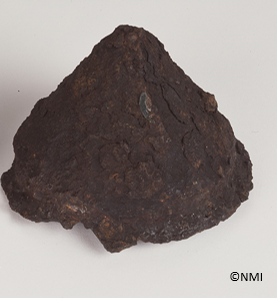 Found closely clustered, the shield bosses are believed to have originated from a single workshop, signifying localised metal production in Ireland. Although male Viking graves are not stereotypical of traditional male Viking burials, female graves do not express this level of local identity and in fact are routinely identical to their eastern equivalent. This has led rise to a number of questions. Were female Viking graves more conservative than male graves, again tying in with this question of male dominance and power, or were the female graves trying to preserve a Scandinavian identity which was otherwise being rapidly assimilated into Irish society? The question as to if Dublin really was the dead centre of the Viking west still remains a topic for debate. However as Dr. Harrison points out that regardless of the direction in which you approach Dublin you will undoubtfully pass a Viking burial complex. Not only are these complexes mapping out Viking Dublin but are also gallant expressions of a formidable community. We wish Dr. Harrison all the best with his book and further projects and once again thank him for coming and delivering a fascinating talk.